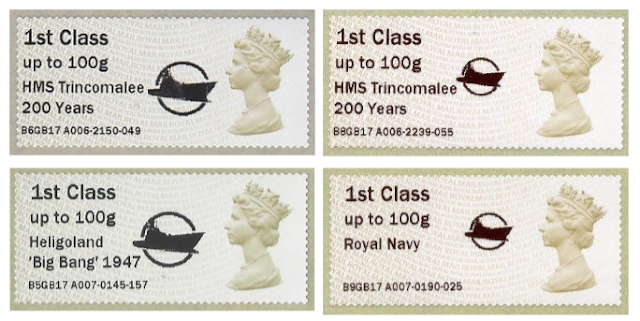 Stuart Leigh writes to report that at least some of the Post and Go machines at Royal Navy Museums are dispensing stamps with a changed logo. "To date I have only found this on A002, A006 and A007 – The NMRN, HMS Trincomalee and Museum of Naval Firepower." The logo on the inscription for HMS Queen Elizabeth at RMRN was smaller than that used for the Battle of Jutland commemoration. Stuart's Post and Go Checklist can be downloaded here. As usual, we are only reporting these but will not be stocking them. Who controls the issues of P&G stamps from these locations/machines, have they become the cash cow that I always expected. Is there a body that has to approve changes or is at the whim of the provider? http://iarroyalmailpostandgo.com/latestnews/nmrn-request-amendment-a002-overprint/ would suggest that it's the organisation who pays for the kiosks ratehr than Royal Mail. I assume the battleship graphic will revert to its original size after 18 Sept (finish of QE carrier overprint). Looks like the graphic is a common file that is selected for all RN museums overprints and as such HMS Caroline, which I believe has had its refurbishment completed and therefore open to the public, would also be subject to issues with reduced graphic for the limited period. How many more unannounced changes ! Despite previous complaints to Royal Mail and its lack of keeping collectors up to date with Post & Go News (Web page has not been updated since June 2017), its now becoming a lottery as to whether one can guess what will change next. Its thanks to people like Stuart Leigh and this blog that one can keep up to date with these issues. Yes, thanks to Stuart and all the people who support his efforts: I'm sure he has as many people feeding him with Post & Go data as I have with Machin and postmark data. Chris - the reduced graphic was announced on the IAR website prior to the QE carrier overprint appearing. Gibraltar has now added them to their website, no indication as to the machine used to print the values though.